Elevator dress shoe with upper in brown shell cordovan leather characterized by its natural sheen which gives a unique and extremely elegant touch to any style. The genuine shell cordovan leather is the result of an accurate crafting of the equine's rarest and finest part. Channel stitched leather sole. 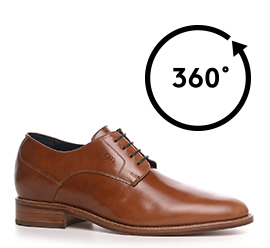 A handmade dress shoe designed for a man of class that can increase height from 2.4 (6 cm) up to 3.1 inches (8 cm).